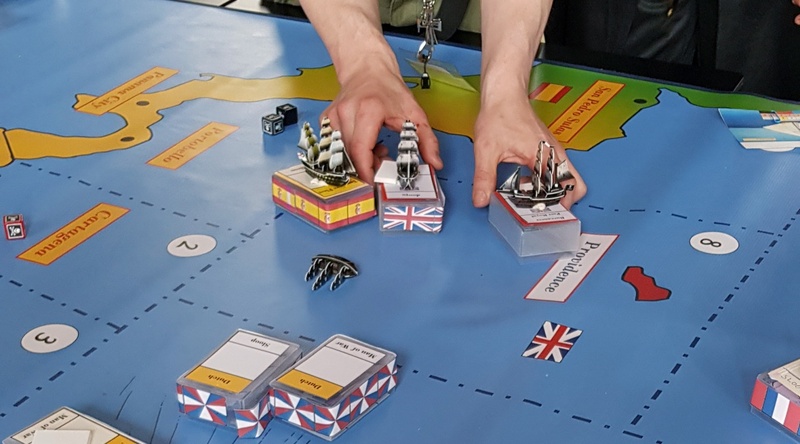 Pirates are a popular megagame theme, and I approached my third swashbuckling megagame with a familiar excitement. Buccaneer is by John Sharp, the same person as The Pirate Republic, but it’s not a rerun or a sequel. Much like with Everybody Dies 3, it’s actually based further back in time – before the pirates took over Nassau, before they even called themselves pirates at all! Instead, I was heading up the Buccaneers (which are totally 100% different to pirates) in Tortuga, while another group of Buccaneers was headed by Sir Christopher Myngs in Port Royal. We were obviously better than them in every way – we were French, while they were English. They were landlubbers and gentlemen, while were were true dogs of the sea. And they worked with the disgraceful Henry Morgan, the foulest being known to man. My name was Alexandra Exquemelin. Don’t worry – by the end of the game, my name was far easier to spell. As Tortuga was completely under pirate control, one of us was supposed to stay on the island to keep an eye on it. That sounded very unpiratical, so we all set out across the seas. Apparently the other team of pirates were repeatedly raiding it, but honestly it didn’t affect us much. I did invest a bit of money there initially. I bought an armoury, so free guns, a distillery so lots of rum, and a house of ill repute for my second in command Francois Ollonais to house his mistress. It was also essential to secure Letters of Marque for my team. These are deeds that commission buccaneers for the service of one government or other (essentially turning us into privateers). They are required in order for Buccaneers to operate within the law – otherwise every government vessel in the sea would be after us. The French promised us something vague, so instead I headed to the Dutch leader Maarten Tromp, played by Mr Megagame. He struck a hard bargain, but I negotiated an agreement of 16% of our takings from raids on the English, in return for Letters for all of my team. I began the day pretty furious with Henry Morgan, and early on spread a rumour that he had *ahem* propositioned a monkey, who had turned him down. The rumour spread like wildfire, and it wasn’t long before most of the room had heard it. Unfortunately, this was the last time I remembered to do anything about my emnity with Morgan, as the rest of the day swept me off my feet. Instead, I set about attacking the English, and my team managed to raid 16 gold from the English by the end of turn one. I rounded down quite significantly, and took a single gold coin to the Dutch, promising more later. I don’t believe I paid them another penny for the rest of the day. A few raids in, and I received my second Letter of Marque of the day, from the French, and Bernard Desjean kindly made it out to last the entire day – for a steep price, of course. After a couple of raids on the English, Ollonais called me over to Bridgetown, which was being governed by Francis Willoughby, a tee-totaller who definitely needed to be shown a good time. He invited us into port, but we had an alternative plan in mind. I’d been asked by Rodrigo de Flores y Aldana, the leader of the Spanish in the Caribbean, to burn down the Bridgetown Warehouse. I would be “paid handsomely”. I managed to agree 5 coin before the attack and another 5 afterwards. I also received a third Letter of Marque – written out for one year, but to be extended upon completion. It was only after my ship was firmly docked in the Bridgetown harbour that I realised I didn’t have an arsonist… or a plan. While Ollonais attempted to seize him while they were both attending church, word came through from his supporters that my presence here was suspect. His fort and ship opened fire on my Brig, Queen of the Deep, and I returned it. It wasn’t enough though, and I prayed that Ollonais was successful. Unfortunately, a series of stalemates in the church meant that my time was running out. With a single hull point left, I marched my men on-shore, laden down with rum. The militia who had never even tasted the divine nectar before were drunk in no time. I tried to head to the warehouse, to set it ablaze myself with my rum as a fuel… when Willoughby cut me off. He’d managed to escape Ollonais and was furious that I’d brought such inebriation to his shores. The fight was short and we both took hits, and eventually I fled to Ollonais’ ship, short several barrels of booze, but up a raw crew who had deserted Bridgetown in favour of rum and the sea. And I had lost my ship. Luckily, it didn’t take long to get my second ship, Sloop Dog. Ollonais took me to Petit Goave, a port under French control, and there I purchased a French sloop for 6 coin. I sent my apologies to Flores y Aldana, who was disappointed that I had failed my mission, but willing to give me a second chance. This mission was to seize a prized racehorse from the Governor of Port of Spain. Little did I know how important a quest this would turn out to be. Around this time I came into possession of a map to El Dorado, which I never had time to track down, as well as realising that a prize weapon had been taken from my own home by Sir Christopher Myngs. I didn’t have much time to care about this, as I set sail for Port of Spain. As I made my way south, I was intercepted by an English vessel – unsurprisingly, as I had been raiding their stuff previously. These Englishmen had also teamed up with the English Buccaneers. It was three ships against one, I didn’t have a chance. I offered my map to El Dorado. I offered my rum. But they wanted none of it. Seeing all hope of stealing that horse slip away from me, I offered the one thing they could never have if they sunk me – my ship. My battered and beaten ship. I saw Edward Collier’s eyes light up. He was Myngs’ first mate, and had apparently wanted his own ship for a long, long time. I promised to hand it over, as long as they escorted me to Port of Spain. I would work out how to get a new ship when I got there. First, I sent word to Flores y Aldana, telling him that I would get him his horse, but I needed the funds for a new ship first. I knew that sloops were available to purchase in every port for 10 coin, so I requested that off him up front. He slashed my total pay, but handed over the money I desperately needed. Meanwhile, I also sent word to others. My fellow buccaneer Erik Nielsen Smit answered the call, as did Desjean of the French… who brought a Man o’ War. As their fleet prepared the cannons, Collier seized me and threatened to slit my throat if they came any closer. But calling their bluff didn’t work, and my men managed to apprehend him. They threw him into a rowboat and sent him back to Myngs. My turn came, and my ship hobbled into port. I actually ended up selling my ship to Collier for 5 gold – 1 less than I bought it for, despite the awful condition – and purchased a brand new one with Flores y Aldana’s money – I’d need something fast to escape in. Next, I set about my plan for the horse. My plan was simple again – it consisted of rum. While a great duelling competition was going on – it immediately preceded a grand horse race – I slipped into the stables, telling them I’d come with a reward from Juan de Viedma for all their hard work. They believed me and drank it down. However, when I tried to sneak the horse out of the stables onto my ship, I almost ran into de Viedma coming to check on his prize stallion. I had been delayed at sea too long. I skulked around the horse race, hoping for another chance to capture the horse, who of course came in first place. But to my dismay, at the end of the race, the jockey continued down the dock straight onto a ship. Myngs’ ship. It seems he wanted the damn horse as well. Even if I could chase him down, I couldn’t outgun him, as had already been proven. Instead, I concocted a different scheme. I would not be shamed by Myngs again! Instead, I snuck back into the stable and found a horse that looked… remarkably similar to the prize racehorse. Who could tell them apart? I rushed it onto my ship, but not before stopping by a local tavern. There, I told the story of a betrayal so foul! It seems that de Viedma had in fact had his prize horse stolen before the race! To save face, he subbed in an alternate, and that was the horse who had won the race, and who Myngs had stolen. I made sure everyone in the tavern heard the story, a story wild enough to be believed, and hopefully to be carried across the sea to Flores y Aldana in Havana. Meanwhile, I started sailing north. I soon heard back from Flores y Aldana – he had received the horse from Myngs, and it had been killed and stuffed. No word on the same having happened to Myngs, worse luck. It seemed my clever lie had not travelled fast enough. Perturbed, I stopped for a moment to catch my bearings and restock. This was all the fleet of de Viedma needed. A privateer caught up with me – alas, I did not know his name – and demanded that I return with him, and the horse, to Port of Spain for justice. I told him that I had rescued the horse from Myngs and was returning it to Port of Spain, but he could just have the horse as long as I could have the finders fee of 10 coin. Unsurprisingly, he didn’t take me up on that offer. My third battle of the day, this time supported by Smit, went about as well as the previous two. Two points left on my hull, and I gave up any hope of getting money for this damn fake horse. I tossed it onto a (presumably very sturdy) rowboat, and fled before he could inspect the horse thoroughly. My fake horse was good quality. It was possible he wouldn’t realise the deception until he tried to race him. Meanwhile, my fellow buccaneer Ollonais had become betrothed to the daughter of the Governor of Petit Goave, and I had agreed to supply YET MORE RUM. I don’t know why I had so much of it. I turned up, rum in hand, and raised a glass to my old friend. This was when the bombshell was dropped. Desjean, Admiral of France and my rescuer from Myngs’ men, had bequeathed my own colony of Tortuga to Ollonais. I was outraged… though only for a moment. Instead, Desjean offered me the colony of Port de France. Far greener than the rocky outcrop of Tortuga, he even offered to buy my buildings in Tortuga so I could rebuild in Port de France. Naturally, I also renamed it, in my image. Welcome to Alexandria. Finally ditching my unpronounceable surname, I started over in Alexandria. I had high hopes for my new town, and the riches I had just received from Desjean went straight into purchasing some troops to keep me safe there. I docked my ship – I knew I was never going to make it to El Dorado, or to find the mermaids that I knew were out there somewhere. Instead, I focused on what I had always been good at – seizing power. Ollonais, new governor of Tortuga, was bringing people together for a Kingdom of the Caribbean. He had D’Ogeron Betrand, his father-in-law, in mind as king, which therefore would make him implicit heir. But Betrand was widowed, and Tortuga and Petit Goave needed more allies if they were to survive repercussions from the French Navy. I volunteered myself to take Betrand in marriage, and to feel the heavy weight of the crown on my head. Queen Alexandra of the Caribbean. It has a certain ring to it, doesn’t it? There was no time to lose. While Ollonais focused on getting the necessary alliances from the other nations – the British, Spanish and Dutch were happy to see the French brought down a few pegs, of course – I focused on the aesthetics. Firstly, I announced a party for the next summer, where all of the people of the Caribbean could come and celebrate the future of our wonderful land. I commissioned a writer to create the constitution for our new country of the Caribbean. And I paid a playwright to tell the story of our glorious land on stage – there was no better way to get the people to rally behind you than to inspire them. My only Letter of Marque that was still valid by this point was the French one, and I knew that would be renounced as soon as I revolted. The Dutch hadn’t seen more than a single gold coin from me since turn 1. And while I could have gone to the Spanish… I liked the idea of completing the set. I received an English Letter of Marque, and hung it proudly beside the others. I took a deep breath and announced that this party was not just a celebration of the Caribbean culture. It was so much more than that. It was a wedding, between me and Betrand. It was the opening of my new play, Viva Alexandria (well, why the hell not). And it was the unveiling of the new Constitution of the Kingdom of the Caribbean, and our Coronation as King and Queen (co-rulers, of course). It didn’t take long. My husband was taken captive by Desjean in Petit Goave. I didn’t hear any further news from him, but I imagine that he didn’t survive very long. In the aftermath, it occurs that a likely next step would be the conflict between myself and Ollonais. Friends throughout the game, it seems inevitable that we would come to blows when I tried to stake my claim as sole ruler of the Caribbean, while he would have seen my husband’s death as time for him to inherit. I doubt our English, Spanish and Dutch allies would have bothered intervening on either of our sides, and would just have allowed the French to sort us out. I didn’t do any quests. I didn’t wear fancy jewellery, embarrass Henry Morgan, or even make it past 20 on my notoriety scale. I didn’t achieve a single one of my objectives. But I faked a horse, ran away a lot, renamed an island and even became Queen of the Caribbean, for a time. Perhaps my name will live on in the annals of time. Because, even if I was the worst pirate you’ve ever heard of… at least you’ve heard of me. The narrative from this game was one of the most fascinating and bizarre I’ve ever encountered at a megagame! While unfortunately the game ran a bit slow and battle mechanics were unevenly applied (I fought in three battles and each of them were different rules), pirates continues to be one of those themes that just carries a game through. I had a lot of fun, and am still looking forward to my next chance to don my cutlass and bandana. My next game is on Saturday, as an Alien Menace at Lights In The Sky in Carlisle. And there are still tickets left for my own megagame, Trope High, taking place on Saturday 18 May in Leeds.